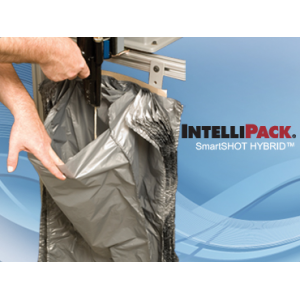 IntelliPack SmartSHOT Hybrid is an innovative cross between a handheld foam-in-place machine and bagger system. An affordable option with the same maximum foam-in-place product protection benefits, SmartSHOT Hybrid comes in multiple bag and stand dimensions to best suit your needs. A hand-held/bagger machine  all in one! Small footprint, cost-effective bagger option for low-volume users. Package a wide variety of products with one piece of equipment. Telemetry: self-monitors system performance, tracks the usage of consumables, and automatically reorders supplies. Affordable option, same maximum foam-in-place product protection benefits. Maximum reliability. No more costly, unexpected downtime. Enables operations with diverse product lines to deliver consistent packaging protection. Automatic. Ensures products are protected with the right amount of foam and film, each and every time.